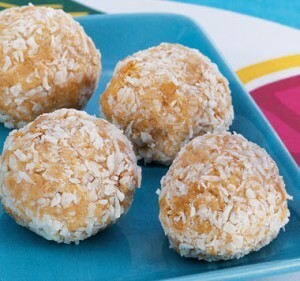 For a yummy, bone-healthy treat, try one of these three easy recipes for Almond Butter Balls! Great for breakfast, school lunches, snacks, or dessert! Roll by teaspoonfuls into balls. Place on serving dish. Refrigerate. Serve chilled. Roll by teaspoonfuls into balls. Then roll the balls in coconut, and place on serving dish. Refrigerate. Serve chilled. I think I definitely need to try the chocolate version! Yup, the dessert recipe with the organic dark chocolate chips were scarfed down first in our house, but I like all three recipes. The basic recipe only takes about two minutes to whip up, which is great for all of us supermoms who want super-healthy kids. Next time you come I’ll make all three recipes so that you can vote on which type you like best!